A wonderful new accomplishment in the field of aeronautics was accomplished the other day. 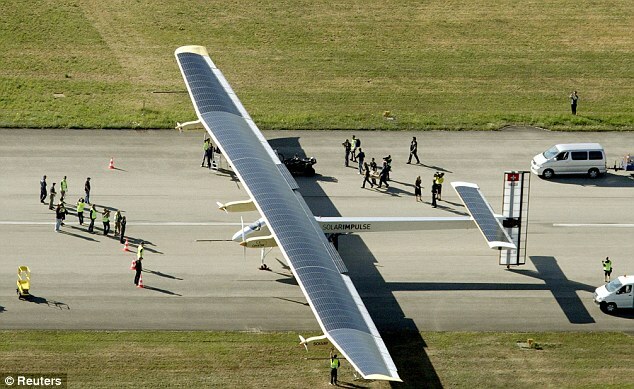 The first ever of its kind, the solar-powered airplane completed part of its journey from California to New York; landing in Phoenix, Arizona after an 18-hour flight. Solar-powered airplanes have long been a hobby of aeronautic enthusiasts, and a long term goal of plane manufacturers, but getting the engine to the sort of efficiency needed to fly during both daytime and nighttime conditions hasn’t been invented yet. Hopefully, this new development will spur a new wave of research and testing to create the world’s first solar-powered commercial airplane. Pilot Bertrand Piccard flew the impulse plane an average of 10,000 feet, and an airspeed of roughly 40mph. As far as flight goes, this is an extremely slow test, but a giant first step in the right direction. For the next part of the journey, Solar Impulse CEO Andre Borschberg will be in charge as the duo complete the 4-part experimental flight. This flight will break a slew of records, and set the standards pretty high for the next group of adventurers to continue paving the way for solar-powered airplanes to become a regular thing. For many observing the journey, this feels a lot like it might have when Orville and Wright flew their first plane. Both pilots will continue alternating turns at the controls, giving one another mental and physical rest from the endeavor. Millions of people are watching this event, which puts a tremendous amount of stress on the two pilots, though they’ve both been in high spirits since their launch. The field of solar aeronautics is definitely something to keep an eye out for in the next decade or so.